Theresa Anna Vogel, nee Cortner, 92, of Jackson, MO, born June 17, 1926, in Belleville, IL, died Tuesday, August 7, 2018, in Cape Girardeau, MO. Mrs. Vogel was a homemaker. She was a member of Sacred Heart Catholic Church in Du Quoin, IL. 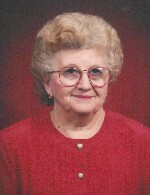 She loved quilting, music, gardening, and dancing, but most of all, enjoyed her family. Theresa was preceded in death by her parents, Charles and Mary, nee Karban, Cortner; three sisters, Gertrude Roth, Viola Kunkelmann, and Eleanora Vollmer; and brothers-in-law, Aloys Roth, William Englerth, Lorraine “Larry” Kunkelmann, and William Vollmer. eight grandchildren, Layel (Ted) Hunziker, Jared (Angie) Vogel, Robyn (Andy) Cox, Logan (Brianna) Clark, April Clark (Roger Johanson), Kacie (Nathan) Jones,Toni Taylor (Jeff Dorr), and Vanessa Vogel; and several great-grandchildren. Memorials may be made to National Alzheimer’s Association. Condolences may be expressed to the family online at www.rennerfh.com. Funeral: Funeral services will be held at 11 a.m. Friday, August 10, 2018, at George Renner & Sons Funeral Home, Belleville, IL. yes your mother also reminded me of Mrs cleaver house was always clean and always fed us unless we bought pizza and fed her. she must of guided you all to eat at the Mexican restaurant for I could see you all. love to all and let's get together sooner than later. Maria, Diane and Ken, Your mom always reminded me of Mrs. Ward Cleaver. Her home was impeccable, she had a warm, friendly and bubbly spirit, plus I only remember her wearing dresses or skirts. She was a good person and made this world a better place. You all have our condolences and prayers. Mom & I send our sincere condolences, thoughts & prayers to all the family. May she rest in peace. I enjoyed having your mother as my neighbor for so long. I also enjoyed talking to her and seeing her at Mass. My thoughts and prayers go out to the entire family. Love to all. I remember us all ride sharing in grade school. She was always so nice to me. My heart goes out to you all.